Did I read correctly that you personally laser etched these images? How did you manage this? I’d love to laser etch my own. BTW, check out my own moleskine at my website. Wow, that came out really well! 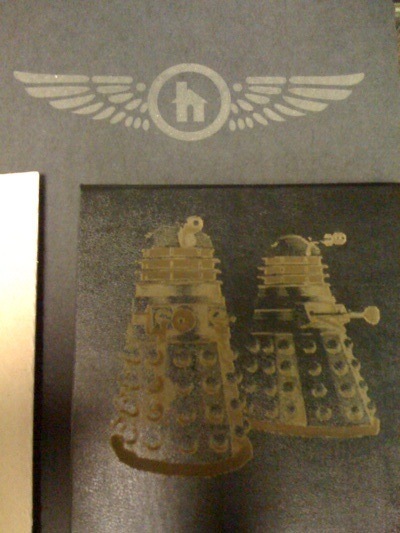 I especially like the greyscale on the Daleks. Around the feet it looks like the laser etched pretty deep, does that compromise the integrity of the cover at all, or is it just visual? Gordon, the cover seems fine. It didn’t cut very deep. Looks sweet! Ruth and I should check out TechShop one of these weekends. We’ve just gotta figure out what to make. How much work was this project, by the way? As far as pre-prep and shop time?